Surely It Can't Be True That Not a Single Civilian Died in the Atomic Bombings of Hiroshima and Nagasaki?! What would you say if someone were to come up to you and make the following statement: that during the atomic bombings of Hiroshima and Nagasaki, not a single civilian was killed? What would you think of the person, what would be your conclusion as to what kind of person could possibly be making such an inane statement? That the person was mad? That he was delirious? That he was an extreme example of a conspiracy theorist? Surely, that he must be American (and an American conservative to boot)?! In fact, there is only one conclusion to make, and that is the following: that the person was a member of the Japanese government in the 1930s and 1940s. Lance or spear practice was a regular women's exercise to practice for the anticipated U.S. landing. My uncle, who was disabled, had been sent to a mandatory training camp to practice with wooden bullets and makeshift weapons to do his civilian share in greeting American forces. Hiromi Hasai was being trained to make machine gun bullets when the flash from the atomic bomb that destroyed his city lit up the already bright morning sky. Just 14, he had been pulled from school a week before to help Japan’s failing war effort. So, a young teenager of only 13 or 14 ("just 14"), and already working on weapons? It confirms — if need be — everything we knew about Japan's plans for the war to continue — to the very last man, woman, cripple, and child. quips Benny Huang in his piece on The New Liberalism (Their Hurt Feelings Trump Your Constitutional Rights). As in, so-called religious liberty. Religious liberty exercised by people she doesn’t like. Therefore, not real religious liberty. And to think that journalists used to act as bulwark against governmental tyranny. These days we can count on the press to be several steps ahead of the government in its zeal for violating our most basic freedoms. If Emily Bazelon actually cared about our constitutional rights she would ask the opposite question—namely, what are the limits of government coercion? The fact that she doesn’t tells us a lot. … Either religious freedom includes the right to make other people feel bad or it doesn’t. If it doesn’t, then neither the florist nor the pastor is safe. Another problem is that anyone declined service for any reason could claim to be “judged and mortified.” I’m sure Chuck Netzhammer felt “judged and mortified” when he ordered a confederate flag cake, superimposed with the words “heritage not hate,” from Walmart, and was refused. In fact, I know he was. “I am highly offended, distraught, and in tears…”said Netzhammer. … The third problem with Emily Bazelon’s argument is the most troubling. Never in a million years did I believe we would get to the point that actual adults—Americans, no less—would make a serious argument that hurt feelings trump constitutional rights. … Louise Melling [of the ACLU] essentially argues that religious freedom must never include the right to engage in economic transactions on a voluntary basis because people are somehow harmed when they are turned away. … Melling argues that there is real harm done…to people’s feelings! “People turned away by an inn or bakery suffer the harm of being told that their kind isn’t welcome,” she writes. Um…so? She’s clearly implying that we as Americans lack the right to tell someone else that their kind isn’t welcome. Her statement represents a sea change in the ACLU’s philosophy which used to take a strong stance in favor of our first amendment rights, even if it hurt people’s feelings. A telling example is the one they always trot out to prove that they aren’t a bunch of left-wing hacks. In 1977, the ACLU took the side of a Nazi group that was denied a permit to march through Skokie, Illinois, a city with a substantial population of Holocaust survivors. The ACLU maintained that supporting the Nazis’ constitutional rights in no way amounted to supporting their abhorrent ideology. I agree. But I’m not sure that today’s ACLU would take that case and if they did they would be hypocrites. Why? Because the clear message of the march was “Your kind is not welcome.” The ACLU used to believe that conveying such a message was within our rights but they’ve recently had a change of heart and decided that we all have a right to feel welcome. That right cannot be secured without the kind of heavy governmental coercion heretofore found only in novels about the dystopian future. And Canada. Not everyone has this right, of course. Chuck Netzhhammer can still be made to feel that his kind isn’t welcome because he’s a poor white southerner. But homosexuals’ delicate feelings are always and everywhere protected. Smiley face fascism is here and it’s up to us to fend it off. writes Dan Mitchell, referring to the artwork of Cato's Silvia Morandotti. But as politicians figure out the electoral benefits of expanding programs and people figure out the that they can let others work on their behalf, the ratio of producers to consumers begins to worsen. 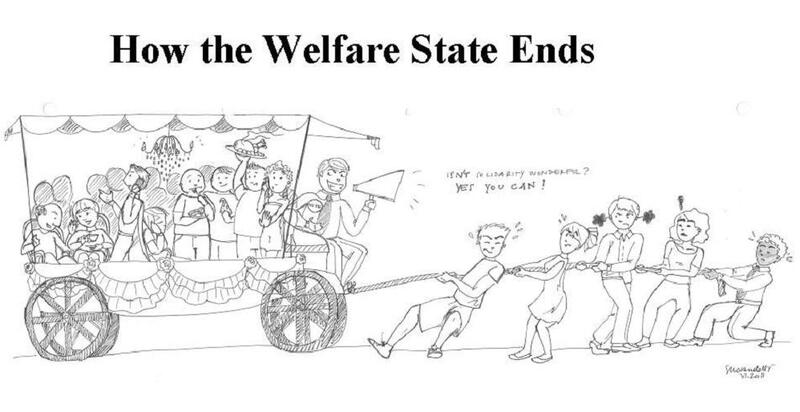 Eventually, even though the moochers and looters should realize that it is not in their interest to over-burden the people pulling the wagon, the entire system breaks down. Then things get really interesting. Small nations such as Greece can rely on permanent bailouts from bigger countries and the IMF, but sooner or later, as larger nations begin to go bankrupt, that approach won’t be feasible. PJTV - Jon Stewart, War Criminals & The True Story of the Atomic Bombs - Bill Whittle from adrv on Vimeo.